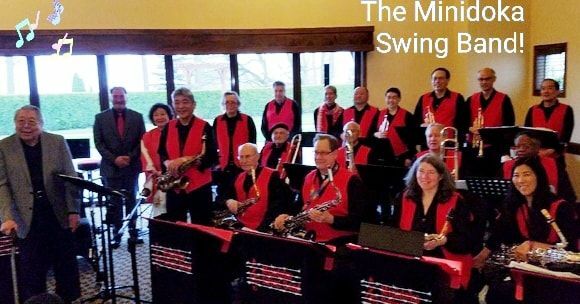 The Portland-based Minidoka Swing Band was formed in September 2007, as a tribute to Japanese Americans interned during World War II and to highlight the music popular in the Internment Camps. Affiliation: the Portland Japanese American Citizens League (JACL). We dedicate our band to our founder and creator, Robbie Tsuboi, 1949-2010. She inspired us to continue being the Minidoka Swing Band! PHOTOS by Bruce Brown, RIP 1932-2015, our #1 "MSB Groupie" and Rich Iwasaki, Location Photographer ... Thank you! THANK YOU to Dream Host for hosting our non-profit web site! A Tribute to Japanese-Americans interned during WWII. Remembering the Big Band Swing music and the entertainment it provided to Internees for those Saturday dances! Come join the Minidoka Swing Band at this wonderful celebration in Eugene at the Lane County Events Center. Come join the Minidoka Swing Band at this wonderful celebration in Newberg, OR at the Chahelem Cultural Center. This is a full day exhibits, flower show and entertainment. The band will start the days lineup of Main Stage entertainment at 10:00am. View the website for a full lineup. I didn't get a chance on Saturday night to tell you both how wonderfully the band played; you all sounded so tight! All my friends who came really enjoyed it and probably would have gotten out on the dance floor, but there were professionals out there! Really, we just enjoyed watching the dancers and listening to the great music. You all sounded marvelous and I hope it met your expectations. I was so happy that Oregon Nikkei was able to combine our groups together. Thank you so much for agreeing to play for the event! Sam took some photos, so I will post them on our website. I am currently in the process of getting ready for an exhibit, so it will take me another week or so, to get them online, but I'll email you when it's up. Again, thank you so much for the fabulous music. My 91-year-old friend was enthralled and you brought her back to her past in a flash. Just wanted to say that we went to our first Minidoka Swing Band performance on December 1 in Oregon City. We give the performance an A+!